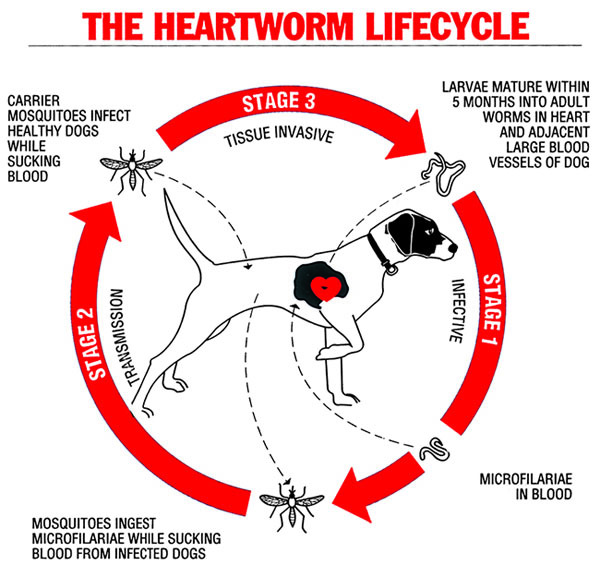 Heartworm has a complicated life cycle. Infected dogs have microfilaria, an immature form of heartworm, circulating in their bloodstream. Microfilariae are sucked up by mosquitoes when feeding on the blood of infected dogs. The immature parasite develops into a heartworm larva inside the mosquito, then a single bite from a carrier mosquito can infect your pet (dog or cat). As the worms mature in the heart they can cause a physical blockage as well as thickening of the heart and associated blood vessels. In the early stages of infection there may be no visible signs however, infection may eventually lead to signs of heart failure such as reluctance to exercise, lethargy, coughing and even death. Heartworm is present throughout most of Australia (except Tasmania and arid areas). Thankfully, heartworm is very easy to prevent and should form part of your pets' health care routine. We have very effective preventative treatment options available including spot-on's and an annual injection for dogs to be administered by one of our vets. If your pet has not been on heartworm prevention we strongly recommend a quick 10 minute heartworm test prior to starting a preventitive program.